Dimitri Verhulst was born in 1972 in Belgium. He made his literary debut in 1999 with the collection De kamer hiernaast (The Room Next Door). The novels Problemski Hotel (2003) and The Misfortunates (2006) were very successful and marked his literary breakthrough. His books are translated into numerous languages; The Misfortunates was also adapted for the cinema and received several awards. 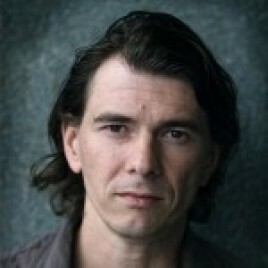 Dimitri Verhulst has been awarded many literary prizes, such as the Libris Literature Award in 2009. Dimitri Verhulst wrote in an interview: "My nationality is literature: I might not have been born there, but it is definitely where I will die. And if literature transcends anything, it’s borders."